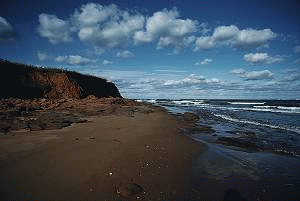 PEI is a beach-lover's dream. It seems that no where on Prince Edward Island doesn't have a beach to offer. This 300 km (186.4 mi.) drive passes through an area featuring festivals, historic architecture, secluded beaches, red sandstone cliffs, and fresh seafood including lobster. The drive starts in PEI's second largest city Summerside, with heritage homes and historic shipbuilding facilities. Spinnaker's Landing marketplace on Summerside's waterfront offers giftware, crafts and good food. Passing through the centre of town is the Confederation Trail, an old railway line that now offers bicycling or walking right across PEI. The province's Celtic heritage is displayed at Summerside's College of Piping. PEI's other culture, the French-speaking Acadian culture, can be experienced at The Acadian Museum. Lobster suppers can be enjoyed at the Centre Expo-Festival Centre and other restaurants along the Drive. Beyond Portage the natural landscape offers pleasures for beachcombers and birdwatchers, and Cedar Dunes Provincial Park presents beautiful beaches and nature walks. PEI's historic industry of fox farming can be explored in Alberton. More beaches, seaside restaurants, and birds including blue herons are seen in Tignish and Northport. Shopping for island-made yarn and blankets can be enjoyed at the Old Mill Craft Company shop in Bloomfield. Drive past fields of PEI potatoes on your way to O'Leary's Potato Museum. Mi'kmaq crafts, cuisine, and culture can be found on Lennox Island. In Green Park Provincial Park, PEI's shipbuilding history is highlighted in displays, as well as a shipbuilding magnate's restored Victorian house open for tours. Enjoy more local seafood at the annual Oyster Festival in Tyne Valley in August. Hilltop Acres Bed & Breakfast B&B Ellerslie 694 Bideford Rd. La Petite France B&B Alberton 441 Church St.
Serendipity Bed & Breakfast Inn And Coach House B&B Central Bedeque 77 Linkletter Ave.